The one-year countdown to the inaugural Special Olympics Ontario Invitational Games has begun. At the Toronto Police annual Police Week launch on May 14, the flag was unveiled by Maplewood High School students. Chief Mark Saunders is the Games’ Honorary Chair. “This is going to be the first of its kind in the world, so we are excited as the time draws closer and I am honoured to be the Chair,” he said. Nearly 2,500 participants from around the world, ranging in age from 13-21, will take part in the Games from May 14-17, 2019. 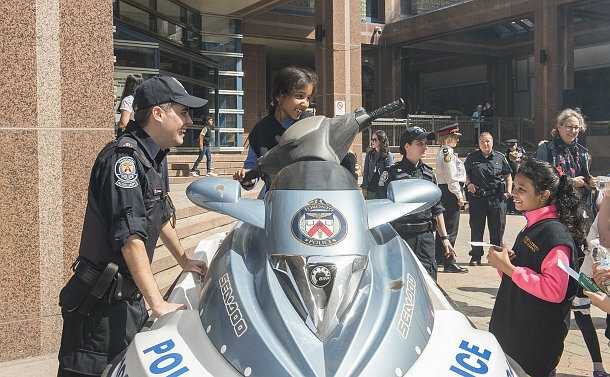 The Service’s Torch Run is the major fundraiser for Special Olympics Ontario, a registered charitable organization that provides fitness, recreation and competitive programs for athletes with intellectual disabilities. Const. Lorne White, with the support of retired Chief Jack Marks, organized the inaugural Torch Run in Canada, in 1987, that brought together runners from 36 law enforcement agencies. They covered nearly 900 kilometres before lighting the flame at Varsity Arena to kick off the International Floor Hockey tournament. White attended the Police Week kick-off. 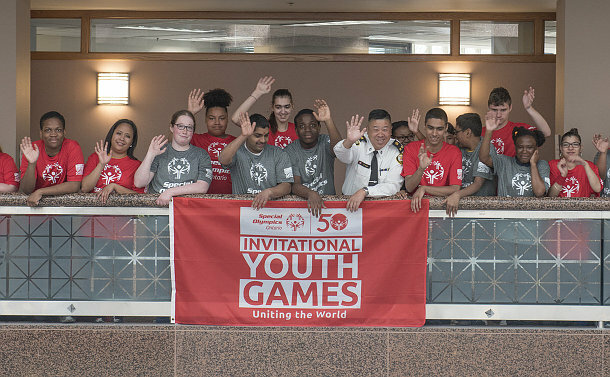 “Special Olympics have always had a place in the hearts of Toronto Police,” he said. “As we strive to work when it comes to keeping our community safe, we know that the most powerful tool is collaboration,” said Saunders. Toronto Police Services Board member Jim Hart said the board believes community policing is a joint endeavor. Joe Couto, the Ontario Association of Chiefs of Police director of government relations and communities, was the guest speaker at the Police Week launch. Students from Church St. Public School sang the national anthem to kick-start the program.